Celebrate the joyous season of Christmas as our forefathers did 300 years ago. This holiday tour brings to life the spirit, sights and sounds of Christmases past. Christmas in Williamsburg is festive indeed especially with its colonial holiday decorations using real fruit, bayberry and magnolia leaves, evergreens, holly and ivy. 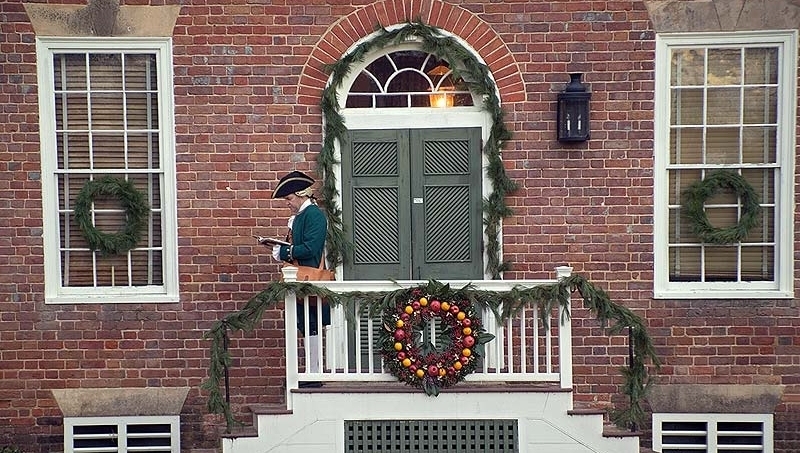 Delight in colonial entertainment and dinner at an historic tavern. Also visit Washington DC to see our great national monuments, memorials and museums. Flight to Washington D.C. Guided tour of Arlington National Cemetery to see Changing of the Guard ceremony at the Tomb of the Unknown Soldier, Kennedy grave sites, Challenger Memorial & Women in Military Service Memorial. Arrive at the Westin Arlington, VA for a two nights. Visit the National Christmas Tree at the Capitol Building. Take the “Night Light” tour of D.C. featuring Washington’s monuments and memorials illuminated at night including: Lincoln Memorial, Jefferson Memorial, White House, Washington Monument, J.F.K. Center for the Performing Arts, the Capitol, & more. Breakfast. Discover our nation’s beautiful capital city on an all day guided tour of Washington D.C. featuring Martin Luther King, Jr. Memorial, WWII, Korean, Vietnam, Iwo Jima, Lincoln & FDR Memorials. Drive by Jefferson Memorial, Capitol, White House, Washington Monument, National Cathedral, Embassy Row, Supreme Court, Navy Memorial, Library of Congress & more. Fine dining at charming Filomena’s Restaurant. See a live theater production at historic Ford’s Theater - the site of the Lincoln assassination. Breakfast. Free time to visit the Smithsonian museums including the Air & Space Museum, the Museum of American History, the Natural History Museum, the Mall Sculpture Garden, the Smithsonian Castle & more. Travel to Williamsburg, VA. Check into the Williamsburg Woodlands Hotel for two nights. Dinner at an historic colonial tavern. Breakfast. Full day to explore Colonial Williamsburg where costumed interpreters transport you back to the 1700s. The colonial houses, taverns, Capitol, Governor’s Palace, the College of William & Mary, the wiggery, the tinsmith, grocer, bakery and Bruton Parish Church are beautifully decked out in colonial style using fruits, magnolia, bayberry & chinaberry, mistletoe, pine cones & boughs, balsam, cedar, camelia & ivy. Dinner at an historic colonial tavern. Breakfast. Visit Mount Vernon on the banks of the Potomac River, home of our country’s first president, George Washington. Flight to Chicago. WHAT'S INCLUDED IN YOUR TOUR? READY TO JOIN AMERICAN CLASSIC ON THIS TOUR? Travel Guard’s Travel Insurance includes trip cancellation and interruption, emergency medical and transportation, and luggage insurance. $850.00 deposit per person with reservation. Final payment due 11/16/18. Refund Policy: Cancellations prior to or on 11/16/18 receive a full refund less a $50 cancel fee. Cancellations after 11/16/18 with insurance purchased, refunds will be processed through Travel Guard Insurance. Cancellations after 11/16/18 without insurance purchased, there is no refund.